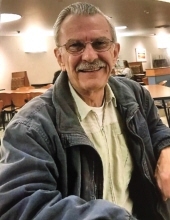 Edward W. Huffman, 73, of Spring Green, died Sunday, January 27, 2019 at Pine Valley Community Village in Richland Center following a brief battle with cancer. He was born on April 15, 1945 the son of William Scott and Lucy (Stanek) Huffman. He graduated from Richland Center High School in 1963 and served in the U.S. Army from 1966 – 1968. He was a tradesman and spent many years in the flooring industry. Ed is survived by two sons, Tony (Renee) Huffman of Acworth, GA and Randy Huffman of Middleton, one granddaughter and one great-grandson. He is further survived by two brothers, Donald Huffman of Hillsboro and James (Sue) Huffman of Yuba; two sisters-in-law, Evelyn (Buford) Gander of Beloit and Janice Ewing of Richland Center; nieces, nephews, cousins, other relatives, friends and special friends, Rosie Luther and Monte Hottmann. Ed was preceded in death by his parents, wife Linda and sister-in-law Sherri Huffman. Per Ed’s wishes, a private family graveside service will be held at a later date in the Czech National Cemetery. The Pratt Funeral and Cremation Service is assisting the family with their arrangements. Online condolences may be at prattfuneralservice.com or cards for the family may be mailed to Pratt Funeral and Cremation Service, 120 N Park St., Richland Center, WI 53581. To send flowers or a remembrance gift to the family of Edward W. Huffman, please visit our Tribute Store. "Email Address" would like to share the life celebration of Edward W. Huffman. Click on the "link" to go to share a favorite memory or leave a condolence message for the family.